Now time to gear up for another round of goodies!! This CROCUS, for the first time, we are presenting a segment called "Art & Craft". Five different project ideas for you and your children! Thematically divided, water is the first element in nature we want to showcase and show our gratitude to. Try the different craftsy delights that our team members Vibha Sharma and Anusha have lovingly put together just for you! Now, here's the real icing on the cake...Illustrator, Lavanya Karthik's colouring sheets are a treat you simply don't want to miss...wherever you are in the world! 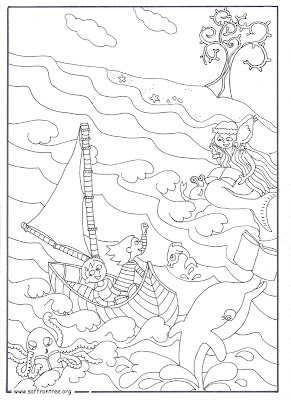 Six colouring sheets just for your children to color/paint on! We just can't wait to have your child part of CROCUS! Now, here's the flyer colouring sheet for your children to work on..Yummy, isn't it? Click below to view/print the image in larger size. 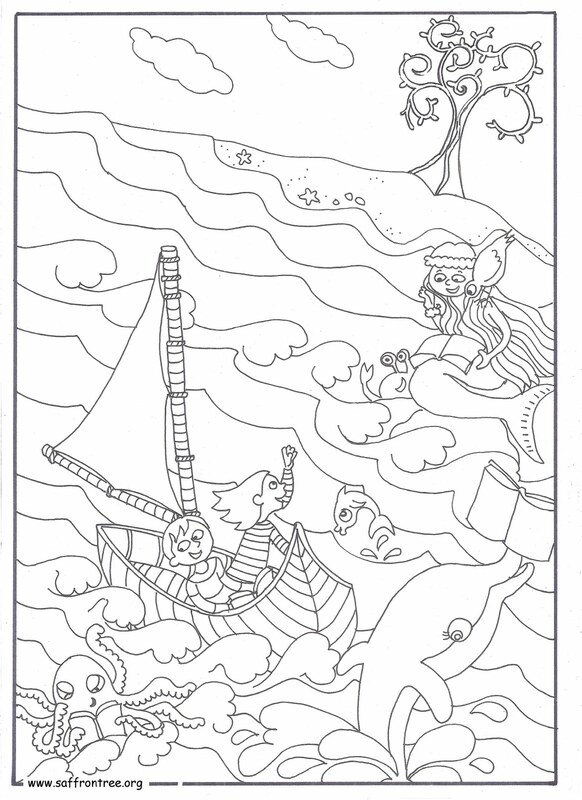 And here's the COLOURING sheet for today's theme - i.e. WATER! Brighten up the two sheets with brilliant colors, and have the grown-ups email back to us. Here are some ideas for shell art activities: How about making some bracelets/friendship bands with assorted colourful shells?! Decorate the picture frames for the personalized touch. 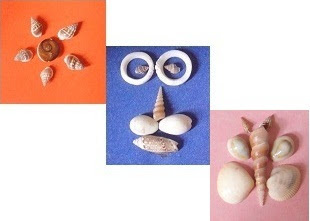 Create a tribal or village scene by using shells as dresses or ornaments of people. OMG...I never realised that we could do so mnay things with the shells ! The next time I stumble on the shells in the beach, all these wonderful images will flash in my mind:-). Brilliant work Vibha and Anusha ! Lavanya, time to take the printout for my little one, who is obsessed with drawing and coluring ! Vibha - the Shell Craft is awe-inspiring! The turtle & butterfly are adorable! simple, connect-with-nature kind of play is priceless...I totally agree with what Mrs.Diaz said in her interview... everything can be a toy in nature for children. Vibha - love the shell art, very creative, we have a lot of shells from our summer beach trips that will be put to good use, thanks to you. Lavanya - the coloring sheets are awesome, will get the boys on it right away. Kudos to both of you on this post, you've got us off on a fantastic artsy start! This is terrific. I have a shell obssesed five year old. Will share it with her. Hopefully she creates something from the 8 boxes of shells we have! Thanks all of you :) I feel shell art or any art/craft for that matter is a kind of therapeutic activity. You feel completely immersed in them and such activities have the way of uplifting the spirits. Wow! This is just in time for the Diwali holidays!